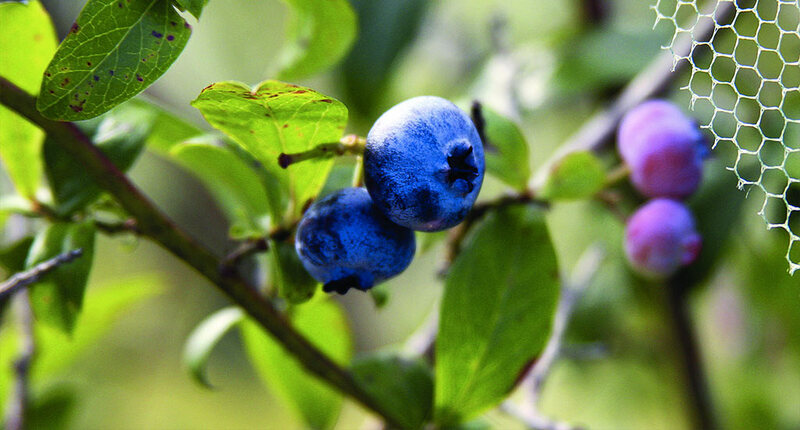 The Murphy Blueberry Farm grows 5 high-bush blueberry varieties on their 2 acres of farmland. Grown without pesticides or chemicals, they are said to be the most flavorful berries many have tasted. You can u-pick at the farm, or, just pick up a pint by calling in advance. Or you can taste their blueberries covered in chocolate at Chilmark Chocolates for sweet enjoyment. Murphy Blueberry Farm began in 1986 when Susan Murphy, a furniture maker and former Chilmark postmaster, and her husband Lynn Murphy, owner of Menemsha Marine Repair (now retired), purchased four hundred blueberry plants from a Massachusetts nursery. They transported them to their Chilmark property in an unconventional way – inside a retired and retrofitted sightseeing bus. Three years later, the first crop of blueberries was brought to the West Tisbury Farmers Market, where Susan had a spot for 12 years. Today, Susan sells berries from her back porch from mid-July through August (call for availability) and operates a U-pick business, by appointment (508-645-2883). Part of the crop can be found at Chilmark Chocolates for their popular summer delicacy: chocolate-covered blueberries.